This is the first Danish edition of People of Darkness, which is the first novel featuring Jim Chee as the main protagonist. This edition was published in 1987 by KLIM in Århus, Denmark. According to Louis Hieb's Tony Hillerman Abroad (An Annotated Checklist of Foreign Editions) the first edition of books published by KLIM are uniform in large paperback formats with more expensive paper. The reissue editions of KLIM books under the Spaekhugger series tend to be smaller and printed on less expensive paper. Additionally, the reproduce the cover art from the first edition in a smaller panel on the cover. Tony Hillerman's original text was translated from English to Danish by Søren K. Barsøe. 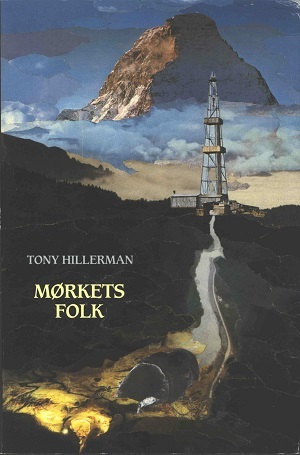 The cover art was was created by Nils-Ole Lund and features a mountain, drilling rig, and a mole. Format: Paperback, 21.4 x 14.2 cm.